When a company is struggling, one of the first reactions is to look at market forces to see whether they are a factor. When they are not, many companies are at a loss to explain the problems and find solutions. Chris Zook is a partner at Bain & Co., a management consultant firm, and served as co-head of its Global Strategy Practice for 20 years. In his new book with James Allen, The Founder’s Mentality: How to Overcome the Predictable Crises of Growth, he draws on his decades of experience to demystify the secrets of companies that push themselves past a slump. Zook spoke about his book on the Knowledge@Wharton Show on Sirius XM channel 111. Knowledge@Wharton: In the notes that come with the book, you wrote that “growth creates complexity, and complexity is the silent killer of growth.” What does that mean? Chris Zook: The early years of a company, the founder years, are almost like a single-celled animal in biology. The founder has perfect information, maybe turns the lights on and off at night. But as the company grows successful over time and is proven in the marketplace, it naturally needs to begin to scale. As it begins to scale, it grows in complexity. It adds layers. It begins to maybe add other businesses. It goes into other geographies. Departments begin to become formed, each with their own expertise strategy. And over time, senior management, if it’s not careful, can move farther and farther away from the frontlines. We found that what we called the founder’s mentality, which are the three great traits that great founders imbued into their companies, can often begin to wane. Companies can lose a sense of the frontlines. They can lose a sense of their mission, and companies at their worst begin to turn into bureaucracies. In fast-moving markets like today, when you become a bureaucracy, it’s all over. The next wave of insurgents begins to take you over. Knowledge@Wharton: The problem of companies being able to sustain their growth is a relatively new problem, correct? Zook: In a database that we have of 8,000 companies, we found that right now only about one in nine companies in the world in the last 10 years has achieved more than a modest level of sustained and profitable growth. It is becoming more difficult, and the cycle times of businesses in many industries are becoming like the life cycles of fruit flies — shorter and shorter. Young companies scale ever faster, setting new records for doing that every decade, and older companies can collapse much faster than we have ever seen before. One of the most amazing and powerful statistics from our five-year study, where we visited 40 countries in the course of it, is that for the largest of companies, 94% say that there are barriers to achieving their growth targets. But by my other statistic, 94% of the barriers are now internal. They are not lack of a market, market saturation, technologies they couldn’t possibly have, unbeatable competitors, government regulation, economic slowdown — none of that. They say in 94% of the time it is internal, and we found that many more than two-thirds of these primary reasons were related to complexity and how some companies age prematurely. Knowledge@Wharton: Are companies making it too hard on themselves with the way they operate and think right now? Zook: I think that companies often encounter the curse of the matrix organization. In our study, we found that most companies that get to be over $5 billion in size have between nine and 14 layers between management and the front line. They encountered what we call the distortions of bureaucracy. Incentives become distorted, and you worry more about your department than the original founder. You have information that you have distorted. What used to be customers known by name become averages manipulated by the staff functions all the way through. The worst of all is that more and more decisions in these companies begin to be made by people who have never served a customer and often never worked in a factory and never been involved in designing a product. That can really be the beginning of the end. Knowledge@Wharton: This founder’s mentality is more toward the thoughts of the company than the actual bottom line. Does the bottom line come as a byproduct of it? Zook: Yes, it’s really about the inner health of companies. I remember reading that the best-selling sports book of all time was The Inner Game of Tennis. This is a little bit the inner game of business. We found three elements that we referred to as the elements of the founder’s mentality, which we felt were the best measures of health inside of a company. Boards of directors don’t typically ask as many questions or track these, although we found they are 85% to 94% of the reasons companies break down on the outside. Number one is what we called an insurgent mission. Every founder is either at war against their industry standards because they are frustrated with it or trying to create something new, like Elon Musk is doing with SpaceX — creating a vehicle potentially to put people on Mars or Google is doing to organize information. Yet over time, companies can become just another company. We found that only 13% of people in the world now say they have any emotional commitment to the company that they spend probably half of their waking lives with. The second element of the founder’s mentality is what we called frontline obsession. A great image for me was a description from Vikram Oberoi, the CEO of Oberoi Hotels, which were voted for a number of years as the best luxury hotels in the world. He would describe how on Sunday mornings he would visit his father, who was a poor villager who began this story in this incredible, humble beginning. Even at the age of 94, he would be holding customer comment cards in front of his eyes when he could barely see, scratching notes about the temperature of the tea for customer complaints. To me, that gets lost often in big companies. The third is what we called the owner’s mindset, which is an aversion to bureaucracy and a desire to jump on problems, take responsibility right away, which often gets lost in big companies. It’s the essence of private equity’s success, in a way. Knowledge@Wharton: What are some examples of companies that are really following this path right now and being successful in the process? Zook: I think AB InBev is quite a remarkable company, now having over 100,000 employees and capturing 30% of the beer market [growing] from what was essentially one single brewery in Brazil that was infused and basically re-founded by the group that is now 3G Capital. That is a great example of the owner’s mentality. L Brands’ Les Wexner [created] seven successful companies in a row … from Victoria’s Secret to Bath & Body Works. To me, he epitomizes the founder’s mentality. A recent Harvard study listed the most successful still-running CEO founders in the world, in terms of shareholder returns, and he came up number one. In terms of an insurgent mission, there is no shortage of companies, from Apple to Google to certainly Nike’s focus on performance. In all of these companies you don’t have 13% of people who relate to the mission, you have much higher percentages. When you have people in a company who say that they feel emotionally connected to the business, they are five times more likely to invest significant personal time in solving a customer’s problem on the spot or offering innovative suggestions. Imagine the difference between a young insurgent company where everybody feels that and a company where people just want to go home at the end of the day. Knowledge@Wharton: You have more and more people, especially in that millennial age bracket, who several years out from the recession now feel more comfortable jumping from job to job after two or three years. That emotional investment may not be there, yet they are still giving a lot when they are there, correct? Zook: Absolutely. When you look at surveys of what millennials want, right at the top is the values of the company and what it stands for and having some special purpose — usually above money and many other financial considerations. One thing that was interesting is we did find quite a few cases of companies that lost the founder’s mentality and renewed it. So, it’s not just something that you were born with and try to hold on to…. Knowledge@Wharton: What are the characteristics of somebody who had that mentality, then lost it and found it again? Zook: It was either more concerned about the bottom line, more concerned for growth of its own sake, which happened years ago to Starbucks and Home Depot, or simply a distortion of what the company really stood for. One of the most remarkable examples of this is the renewal of Lego, which was one of the great founder companies. It was voted the toy of the century. The founder began it in the 1930s. His son, the next generation, took it from wooden blocks to plastic, and the next generation said, “No, it’s not a toy.” Even though it got the Toy of the World Award, and there’s 71 Lego blocks for every human on planet Earth. No, it’s a brand. And it impelled them to go into everything from plastic watches to theme parks to a joint venture with Steven Spielberg on movie-making for children — all of those things were a disaster. It sucked energy from the core, and Lego was almost 18 months away from bankruptcy when the new CEO came back in, went back to the original basics of the bricks, simplified the product line, and now it is the best growth rejuvenation story in Europe. In fact, he brought back the original principles of the founder. They also found out who owned those 71 Lego blocks per person, that there were 350,000 Lego-obsessed people. Some were architects who built Frank Lloyd Wright houses, and some were just young people who maintained it through their lives. They began building them into the product development and having measures of the customer intimacy and loyalty that they had never had before. It really brought back the founder’s mentality. There’s such a tendency to become enamored with the next bright, shiny object or fail to see the full potential in your core. Over and over and over again, it’s just a common theme. In fact, two thirds of Bain’s strategy studies have that as the primary finding. We discovered that companies failed to see the full potential in their core and often needed to shrink to grow. Knowledge@Wharton: You talked about how every company is going to face this, that they have to navigate the problems, that they have these crises of growth. Go into that a little bit more. Zook: Years ago, there was a book called Passages, which was about predictable crises of adult life in your 40s and 50s and 60s. In a sense, we found the same is true of life cycles of companies, and the founder’s mentality played a different role in each of three life phases. One is called “crisis overload,” which is in the growth phase, after the idea is proven and the company tries to scale itself five or 10 times. A company that got into trouble trying to scale itself, for example, was Lululemon. The second one we called “stall out.” This is a case of a very large company that is still growing and suddenly discovers that 5%, 10%, 12% revenue growth has suddenly gone to 1% or 2%. Profits are flat for a while, the indicators are bad — like Starbucks. We found that two-thirds of large companies stall out like that, and only one in six or one in seven actually recover. The third, which happens to fewer companies, is about the obsolescence of their growth model. That happened to Marvel Comics, which was rejuvenated by going back to the characters. Particularly powerful for us was that the decisions made and actions taken around these three crisis moments determined 85% of the value swings of a large company. These three crises and what people do, which relates to the founder’s mentality, drive the stock market as much as anything. Knowledge@Wharton: I would think there are probably a lot of companies out there that don’t consider going back to the past in order to be able to move into the future. 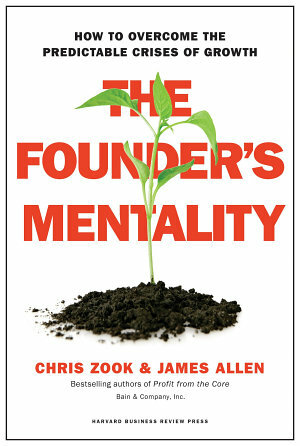 Zook: We did look at the phenomenon of founders coming back because those are obviously the most dramatic examples of renewing the founder’s mentality. Michael Dell going back to Dell, taking it private and saying he wanted to create the conditions for the largest startup on the planet. I talked to Michael recently about how that is going, and he told me that the employee engagement numbers have never been higher and they are re-gaining market share in their core businesses. They just bought EMC, the largest company acquisition in technology. I think it’s very interesting to observe those. Only in a third of the cases, the founder coming back didn’t solve the problem. But in two-thirds of the cases it did end up helping because they brought back the founder’s mentality. Knowledge@Wharton: Was there anything that caught you off guard in doing this research? Zook: A couple things emerged and sort of sunk into my brain and became very profound to me as we went on. One was the incredible humility of many of the great founders of the world. Humility was at the center of many of them. These were amazing, amazing people. Second, I began to realize that right now, in a world that needs better leadership more than it ever has, that more people are looking to founders as models of leadership. There’s even a movie coming out in August called The Founder about the founder of McDonald’s. Six founders in the last 20 or so years by Time magazine have been person of the year, whereas the previous 60 it was only one. So, I think a second thing is how much founders are now leadership lessons. The third thing that was very powerful is, we looked at it across the world and did some analysis of the relationship between how a country is able to foster entrepreneurs and nurture companies in their growth phase, like Silicon Valley does. We found that we had a very, very strong correlation between the growth rates and the robustness of economies, and their ability to foster and encourage young founders. Knowledge@Wharton: A lot of companies these days are not being run by the founder. How does a company in that particular category that has wandered astray get that founder’s mentality? Is it partly a push from the C-suite? Zook: It usually is. We did find that these characteristics of the founder’s mentality can be practiced by any leader. Take Disney, for example. The rejuvenation of Disney over the last decade under Bob Iger is an example of a non-founder coming in but really getting it and rejuvenating the spirit. He bought Pixar. He bought Marvel Comics. He even went and bought the rights to the rabbit that was the hero in the very first Disney animated film. The rights had been sold, and he recaptured it. And I think that is why the board of Disney is so concerned about his ultimate departure; it is very hard to find somebody who can so well re-kindle the founder’s mentality. Knowledge@Wharton: Obviously, the founder or CEO plays a big role in this, but this is something that you want to see filter down throughout the organization. If you have buy-in all the way up and down the line, that founder’s mentality concept does play out throughout the organization, right? Zook: Yes, many of the great renewals that we examined did have most of the action at the bottom of the pyramid. Some of the companies that managed to maintain the founder’s mentality did it by keeping very flat organizations, where there were many positions that we began to call mini-founder experiences. The most sharp example would be something like Domino’s Pizza and the franchisees. The Domino’s franchisee in India I spoke to in the course of doing this study now has 1,000 pizza stores in India and sounded just like a founder, even though he is part of the franchise organization. He described all of the things that he was so proud of doing, like pizza delivery during the monsoons in a half-hour, or tailoring the pizzas to the Indian spice palate. Creating many founder experiences in a company is one way to do it. The other thing is through feedback and making sure the people who are the heroes, who are making the decisions, are the people at the frontline. Enterprise Rent-A-Car, the biggest hirer of college graduates in the United States, puts those people into management positions right away in their 8,000 or 9,000 locations. It gives them a lot of freedom and coaching, and those are, in a sense, all mini-founder experiences.